Pollen grains make up pollen and they are basically reproductive cells that have two nuclei. Pollen grains have one generative nucleus, one tube nucleus and non-reproductive cells as well. There is also a cell wall, also called intestine, which has high level of cellulose. It is protected by the hard outer covering. Pollen moves from flower to flower and they need its protection. The immune system can be hampered and this makes way for the allergies to occur. When we come in contact with certain natural substances, like chemicals or foods, an allergy might happen. It occurs when we make physical contact, inhale or ingest these natural substances. Immune system decides which of the natural substances is essential and which is not, and those which are not are treated as foreign body. If this happens, antibodies are developed by the immune system (they are called histamines) and they are the weapons for battling these foreign bodies. Antibodies degeneration in the body system is caused by the proteins found in the pollen, dust or foods. Additional problems, such as inflammatory reactions and affected lungs, organs, mucous membranes and tissue will happen as well. Bees need to feed and they get pollen from certain flowers that serve them as food. Bee pollen is very nutritious and it has vitamin complexes, enzymes, proteins, essential fatty acids, carbohydrates and so on. As you can see, it is a food with high nutritional values, which can also fight with the allergy symptoms if used regularly as dietary supplement or a part of our nutrition. In England, more precisely London, bee pollen was first used for treating allergies. 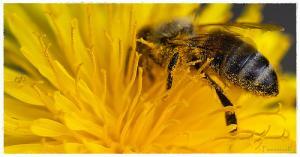 Desensitization is the term used for the treatment of allergies with the help from bee pollen. Bee pollen is a harmful irritant and the treatment we are talking about comprises of bee pollen consumption in smaller quantities. The bee pollen affects the immune system and makes it stronger when it reaches the blood flow. The stopping of the allergic reaction is achieved by increasing the production of histamines, which can be caused by the bee pollen. No hyperreaction occurs and the problem is dealt with after the use of bee pollen. Some of the benefits refer to the treatment of urinary disorders, migraine headaches, bronchitis, asthma caused by pollen and hay fever. People with severe reactions to bee pollen and bee sting can exhibit certain problems with the conduction of this treatment, so they should not use this remedy. It can lead to anaphylactic shock, which causes mouth, throat and tongue swelling and it can affect the breathing and even restrain it. So you can see that it can even cause death among some people. Also, if you are having asthma, see a doctor before starting to use bee pollen. anyone tried Pollen Journal for iphone?